And now it’s suddenly December – just like that! Cookies! Warm and cozy dinners! Hot chocolate! Party snacks! So many things to make! So let’s start with breakfast – how does that sound? A strata, which is just a fancy way to say “breakfast casserole”, is a great option for a special breakfast or brunch because you can easily size it up or down depending on how many you’re serving, you can customize it to your taste, and all the stuff gets tossed into one dish the night before so all you have to do the next morning is bake it. Sounds good, right? This time of year we need all the help we can get and I love the idea of make ahead breakfast dishes that are low-maintenance, but special enough for holidays. 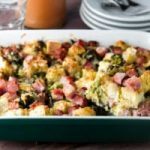 I got the idea for this ham and broccoli strata after finding a recipe for a this recipe on Epicurious.com. 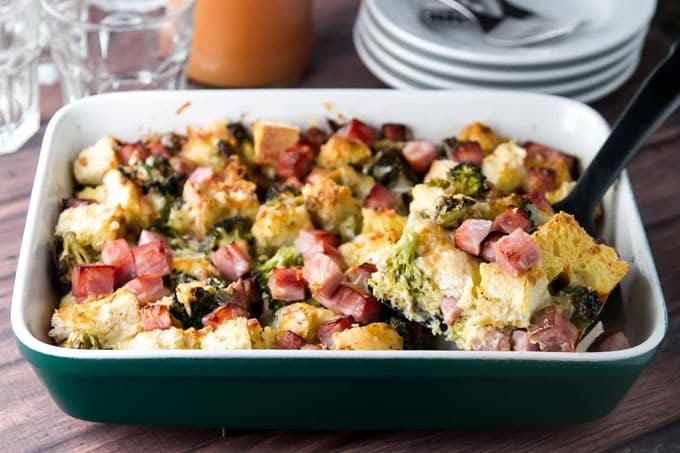 The great thing about a strata is once you get the main components (in this case eggs, half and half, and bread) you can totally customize the other flavors and ingredients – I love the broccoli, ham, and cheese combo, but I will definitely try some other combos, too, like sausage and sage or asparagus and mushrooms. 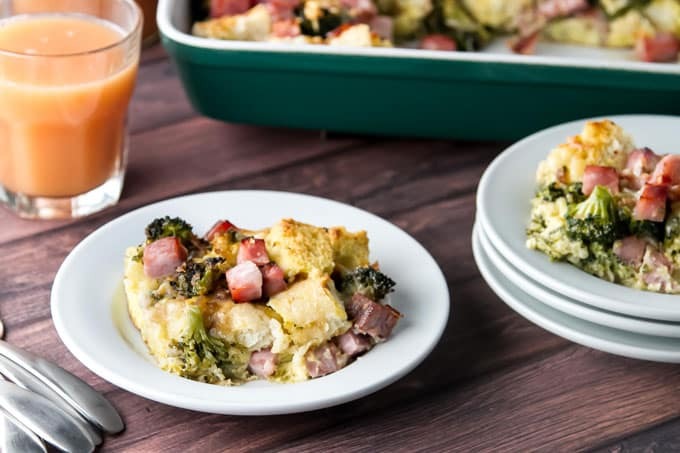 All you need is about 30 minutes the night before to get it ready – broccoli, some red onion, and ham are layered in a baking dish with cubed french bread and plenty of Gruyere and Asiago cheese. Then you pour eggs mixed with half and half all over the top of it. Let it sit in the fridge overnight – the bread needs time to absorb the egg mixture – and then the next morning just pop it in the oven. That’s it! When it comes out of the oven the top is all toasty brown and the inside is soft and cheesy, with savory bites of broccoli and ham. It’s the perfect way to celebrate at breakfast or brunch , especially if you serve up some mimosas to go along with it. Yes! Happy, happy December – I hope you give this one a try! 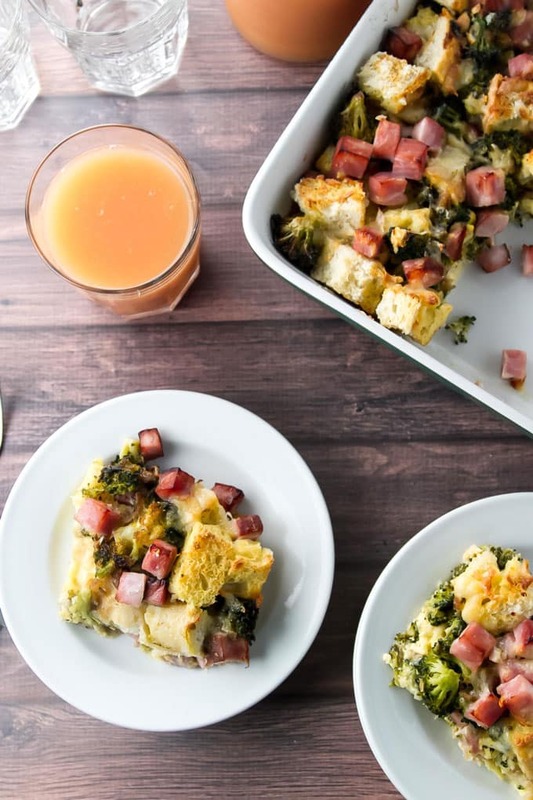 A strata is a make-ahead breakfast casserole and this version has broccoli, ham, and lots of Gruyere and Asiago cheese. It’s perfect for a special occasion breakfast or brunch! In a large pan melt the butter over medium heat. Add the onion and broccoli and cook them together for about 3-4 minutes, or just until they soften. Season the vegetables with 1/2 teaspoon of salt. Remove the pan from the heat and set aside. In a small bowl whisk together the eggs, milk, and half and half. Season the mixture with 1/2 teaspoon of salt and 1/4 teaspoon of black pepper. Spray a baking dish with cooking spray. Spread 1/3 of the bread cubes on the bottom of the dish. Top the bread crumbs with 1/3 of the cheeses, broccoli and onions, and ham. Repeat this layering two more times, ending with the remaining cheese sprinkled over the top of the dish. Pour the egg mixture evenly over the top. Cover the dish and refridgerate it for 8-12 hours. Once the strata has chilled, remove it from the fridge and let it sit on the counter for at least 30 minutes. Preheat the oven to 350 degrees and bake it, uncovered, for 50-60 minutes. Let the strata stand for about 5 minutes before slicing and serving.